TGIF….Happy FRIDAY!!!! 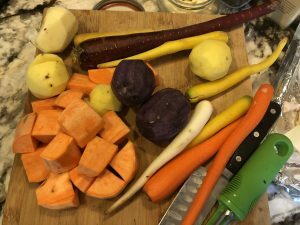 Last week when I went to Trader Joe’s for my weekly grocery shopping…they had the prettiest colored carrots and potatoes so when I got home…I added it to this week menu planning. I had to think of something to make using these vibrant color vegetables. And then my local market had a HUGE sale on chicken thighs so I thought this dish would be PERFECT for today!!! Plus, since its Friday and I didn’t want to spend a lot of time in the kitchen…makes this dish even BETTER. Clean up is fast and easy. I love ONE POT or TRAY dinner!!! Preheat oven to 375F. Line a rimmed baking sheet with foil. Thoroughly wash the potatoes, sweet potatoes, and carrots. Drain in the colander (if you are press for time…take a paper towel and pat dry) and set aside. Wash the chicken and pat dry chicken with paper towel. In a small bowl…mix all the seasoning together. 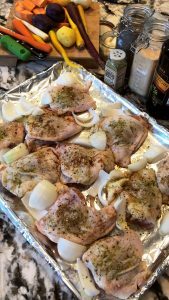 Grease the baking sheet with 3 tablespoon of olive oil….then lay the chicken on the foil and season with half the seasoning. Next, add the onions and smash garlic. Cover with foil and place in the oven and bake chicken for 30 minutes. 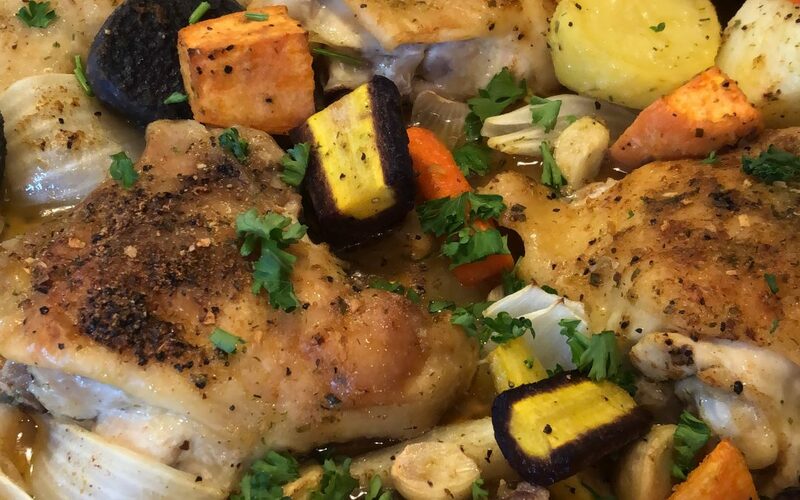 While the chicken is baking…in a large bowl add the potatoes, sweet potatoes, and carrots. Add the rest of the seasonings and olive oil. Mix so all the vegetables are seasons. Set aside. 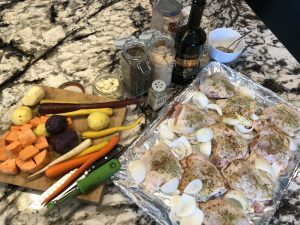 After baking the chicken for 30 minutes…take the chicken out and uncover…add the seasoning vegetables and place back into the oven UNCOVERED for another 30-45 minutes…check for doneness …when the vegetables and chicken thighs are soft and easily pierced with the fork. Turn the broil setting on and broil for about 5 minutes until the skin is GOLDEN BROWN and crispy. Watch carefully, or they will burn. 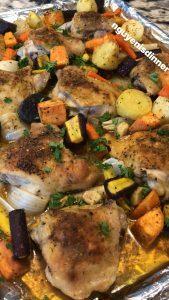 Remove from the oven and serve right away in the baking pan or transfer to a warm serving plate. I usually serve right in the baking pan because the color is so PRETTY…and it looks so rustic. Serve with some spanish rice or butter pasta. 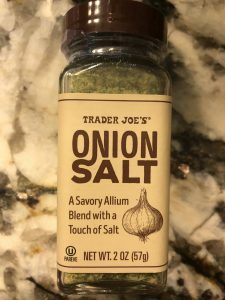 ****if you don’t have Tony Chachere’s or Onion Salt…simply use kosher salt. I made this tonight & everyone loved it. Plus my kitchen smelled great. I’m going to try something new next week. Thanks for sharing…. 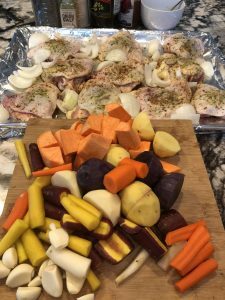 Thank you Jennifer…you should try the roast beef in the crockpot…it is delicious and will make your house smell AWESOME too! !